Every Sunday we shop at the farmer's market and then make a big dinner at home (hoping for tons of leftovers) together as a family. Sunday is easily my favorite day because it's the one with the fewest distractions and we can take our time cooking and then playing together as a family while dinner is in the oven. I confess however, that I can occasionally get distracted and dinner takes the hit. Whether it's because a friend comes over for an impromptu visit or we're immersed in an art project or board game, before I know it whatever is in the oven accidentally gets a bit overcooked. Hence I recently bought not one, but two new kitchen timers. Last Sunday the latest victim of my absent minded mommy brain was a bunch of beautiful tender broccoli florets we had just bought that morning. Sadly, I forgot to turn on the timer and 30 minutes later the tips had gotten a lot darker then I would have liked (note to self_ when buying new timers, remember to use them). Ironically, when we finally sat down to eat, a variety of dishes spread out in front of us, both kids immediately went for the broccoli. Chloe said after her second or third piece_ "it's crispy broccoli". Of course! Kale and Potato Chips are super delicious and full of kid-appeal, why wouldn't broccoli be too? And that's how one of our new favorite side dishes was born. 2. Place the broccoli on a baking sheet (foil-covered if you want to make clean up easier). 3. Spray the broccoli with canola oil or drizzle with olive oil, tossing to coat and sprinkle with salt. 4. Roast in the oven for 25-30 minutes, or until broccoli is crisp. We have done this a few times - on purpose :) Try adding some lemon zest and squeeze with fresh lemon juice when you take it out of the oven. It's delicious. We have also added parmesan for some added flavor. I do this, too. I had a little bit of red pepper flakes and sliced garlic while the broccoli roasts. Like Shira, I had lemon and parmesan afterward (and sliced almonds if I have them). SO GOOD! I love it this way.. :) :) :) My kids actually eat it..
One of my favorite ways to cook broccoli. :-) I usually just keep it in for 20 min, but next time I'll look forward to letting it roast a few minutes longer to get to the crispy stage! my 15 y/o loves it like this. says it's his favorite vegetable! this is how we always make broccoli! we use a recipe online from the amateur gourmet website. at the end, it has you put on lemon &amp; parmesan. my 14-month-old gobbles it up, and when it's crispy, it's easier for her to chew! We love broccolli this way! I also add some breadcrumbs to them. 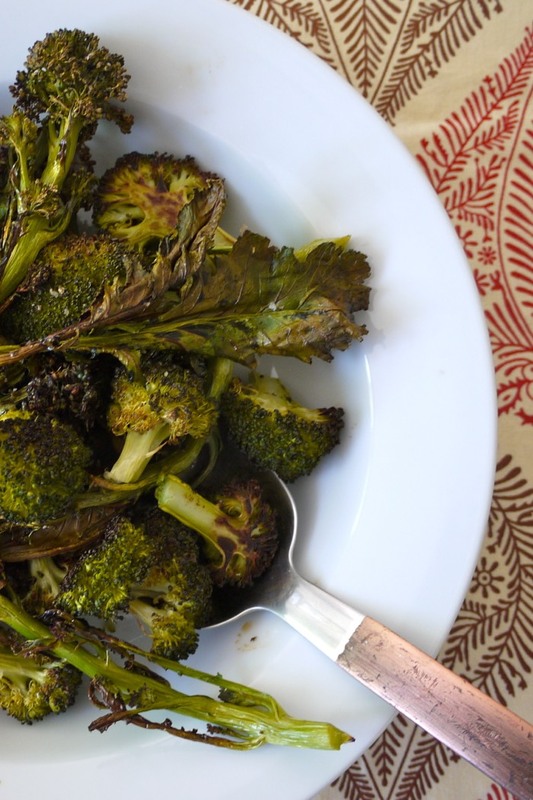 We love broccoli roasted like this, especially with some parmesan and lemon zest. My little guy goes crazy for it. I even put the recipe on my blog. Is this broccolini? It looks delicious! That's our favorite part of roasted broccoli...the crispy parts! Could this work with parchment or a silpat mat? Check your parchment paper package. Some say it's safe up to 400 degrees, or 425, etc. but brands will differ. Usually it's used for baking so the paper doesn't have to withstand really high temperatures. I love parchment because it's so much more eco friendly! You can use either silpat or parchment. Just double check to make sure the one you have can be used in temperatures up to 500 degrees. You can also place the broccoli directly on the baking sheet, that's just more clean up! Absolutely delicious! My husband and I both loved it! Thanks for the recipe! What a great idea. My son will eat broccoli but mostly nibbles. I'll have to try this and see if it goes over better than the steamed stuff. Thank you so much for this! I've been very bored with my run-of-the-mill ways of cooking broccoli and this turned out amazing. My 20 month old daughter was a huge fan. I'm so pleased to have another healthy vegetable recipe that she likes. 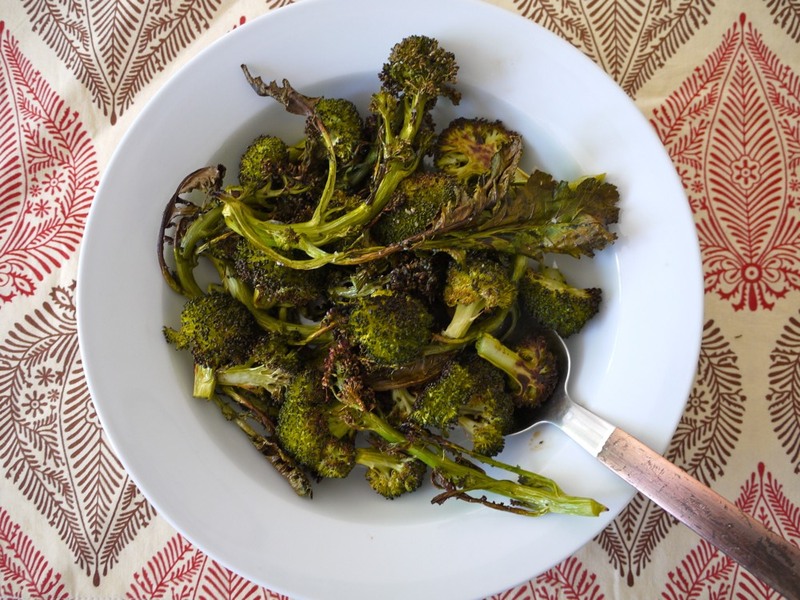 Cut your florets into small pieces, put them in a plastic zip top bag, drizzle olive oil, salt and LEMON pepper to make this broccoli sing. Shake the bag to get the salt and pepper into every space. When it comes out of the oven, it's popcorn-sized pieces of deliciousness. Snaking on these will make you feel like you're indulging! I feel like this was REALLY salty! Are the measurements correct? Could you use frozen broccoli for this? Or only fresh? Only fresh! The frozen broccoli gets mushy! We do this with cauliflower with some Parmesan cheese sprinkled over top. WOW !